Now we're getting somewhere. Tonight's Lost, "Dr. Linus" definitely ranks amongst the best of the Lost episodes. 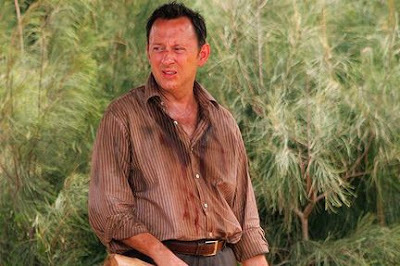 Michael Emerson is definitely one of those amazing actors that can take what is truly a monster of a man and make him sympathetic and pitiable. The way Ben is broken down in this episode, and how it mirrors both Richard's and Ilana's disillusionment, was extremely powerful and moving. Ben also surprised me twice--once for each reality. As professor, nay, "Dr. Linus", ran into belittling circumstances at work, I was ready for anything. I truly wouldn't have been surprised if Ben had killed the principal in order to get ahead, thus proving his island experience just brought out his true nature. But no, in the end, he chose to do the right thing for Alex rather than for his own ambitions. Then, on the island, after facing death at Ilana's hands, we get one of the most emotional scenes of the episode when Ben confesses he's only going to meet Evil Locke on the other island because "no one else will have me." I was shocked when Ilana welcomed him back to the beach, and even more surprised when Ben accepted. The way he stands there, so lonely and dejected as the group greets Jack and Hurley, broke my heart--which is once again a testament to Emerson. Another great thing about this episode, and this season, is that I like Jack again. He's confident, and angry, and just this side of crazy. It's been a total flip on the island, where all the previous shadowy figures in control are now stumbling around blind while the castaways are starting to take charge. The scene with Jack and Richard, with Jack laughing his way through Richard's suicide attempt, was both suspenseful and startling. I am also pleased that Eyeliner Man and New Jack did not get all-blowed-up. I want to see what these two do next, and if Jacob has a good master plan or a really messed up one. Possibly it's both, knowing Lost. As usual, Miles is made of win in this episode as well, communing with the dead and throwing Linus under the bus--and with his own sarcasm thrown back in his face to boot. I also liked the interesting bit that Frank was supposed to be piloting the Oceanic flight that originally crashed--but he overslept. It was extra creepy when Ben told him the island "got him anyway." All in all, a great episode. There've been some highs and lows this season, but "Dr. Linus" has got me looking forward to the next step in the adventure. What did you think of "Dr. Linus?" Vote on the episode over at Lost For a Reason. Watch Lost on ABC, Tuesday nights at 9/8c. PHOTO: Michael Emerson as Ben Linus, Lost "Dr. Linus", c2010 ABC. Yes, I agree. Great episode, brilliant actor. I loved the way that Ben chose to do the right thing (in two timelines, to boot). I had been worried that he wouldn't, afraid he would sell Alex out. I'm enjoying this season. We're getting a chance to revisit our beloved LOSTies, but this time to see them from a slightly different angle. I'm fascinated by the sideways world, and the mysterious connection, and leakage, between the two timelines. I love the way that the LOSTies seem to stay true to the essence of their characters, in the sideways world, even though their situations are so different. It seems to suggest that character -- or is it destiny? -- will carry the day. @MsTerri: Emerson really is so good. I love that his talent won him such an integral role in the story. I really thought he was going to sell Alex out, too--we know Evil Ben so well. I'm curious about the "leakage" too. There are the obvious things, like when they see a "stranger" and feel like they know them, and then there are moments like Ben choosing to do the right thing--possibly because of what he's learned in the other timeline? It's an intresting concept!